The roost has settled on Spirit Mountain Resort, home of the Duluth AMSOIL Snocross National presented by Kwik Trip. Three days of racing garnered two podiums by Pro Am Women rider Taven Woodie, and one podium by brother Kaden. 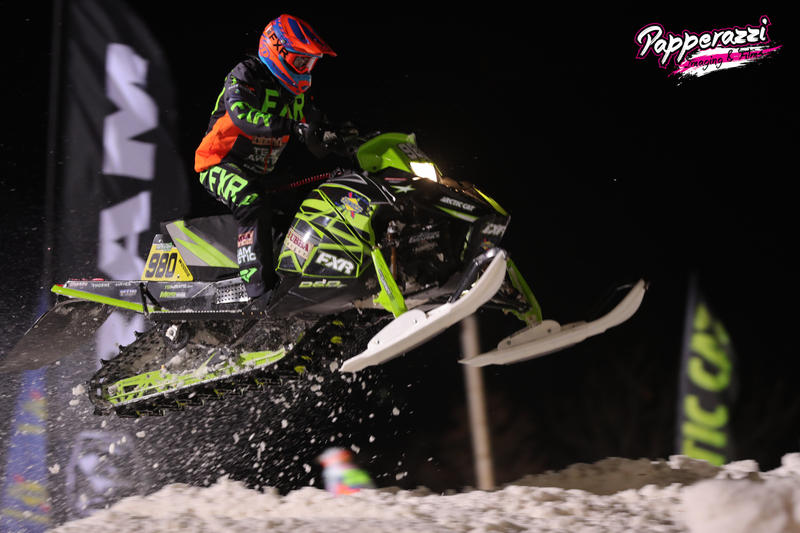 Friday kicked off the 2018-19 Snocross season with Sport class Round 1. Woodies Racing Sport rider Kaden Woodie started strong with two heat wins in qualifying. Leading most of the final, Kaden cased a jump and bent his handlebars sending him out of rhythm on the last lap. He held on for a second place finish and his first trip to the podium. The Friday Night Dominator has become a fan favorite at Duluth. Nearly 30 Pro and Pro Lite riders ran a practice style qualifier to determine the 16 riders that were seeded in a bracket style, head to head, 2 lap competition. Johan Lidman was just edged out in the first round, and Nisse Kjellstrom in the second. Montana Jess didn’t qualify for the Dominator. Saturday’s racing brought series Rookie of the Year Taven Woodie great success in the Pro Am Women Class. The 15 year old looked comfortable in her qualifying rounds finishing with two wins in the qualifiers and a second place finish in the final. Brother Kaden was caught up in a common first turn wreck that slotted him in the back of the pack for the Sport final on Saturday. Pro Lite rider Nisse Kjellstrom advanced to the Pro Lite final where he was caught in a similar pile up as Kaden, putting Nisse behind the field for the rest of the race. Pro riders Montana Jess and Johan Lidman had untimely technical issues during racing Saturday, leaving them both out of the final. Sunday brought out the sun and temps in the 20’s. In what was the most exciting race of the weekend, Pro Am Women final, Taven took an early lead. Navigating lap traffic the last two laps, she was boxed in on the home stretch of the last lap, allowing last year’s champion, Meghan Brodeur, to come back for the win by fraction of a second. The battle between Meghan and Taven is going to be one to watch all season. In Pro Lite, Kjellstrom made it through the first turn smoothly, riding to a solid 4th place finish. Jess and Lidman also saw better riding, advancing to the Pro final. Lidman Finished 9th, Jess had another technical problem and wasn’t able to finish the final. The team will pack up and head west to where it all started for Woodies Racing, for the Jackson Snocross National Presented by Woodies Racing in scenic Jackson, Wyoming. By Nancy Lauseng|2018-11-30T16:09:33-05:00November 30th, 2018|Uncategorized|Comments Off on Woodies Racing Duluth Snocross Recap – Three Podiums!